New York City Ballet is a ballet company founded in 1933 by choreographer George Balanchine and Lincoln Kirstein with musical director Leon Barzin. The company grew from an earlier troupe known as the Ballet Society. One of the foremost dance companies in the world, the New York City Ballet, is solely responsible for training its own artists and creating its own works. The company was the first to establish the United States as a legitimate ballet incubator. The New York City Ballet was also the first ballet institution in the world with two permanent homes, the New York State Theater at Lincoln Center and the Saratoga Performing Arts Center in Saratoga Springs, New York. The New York City Ballet was the brain-child of Lincoln Kirstein, a writer, art connoisseur, and cultural figure in New York City in the 1930s. He is famous less for his own artistic achievement than for his social influence. He envisioned an American ballet where young native dancers could be trained and schooled under the guidance of the world's greatest ballet masters to perform a new, modern repertory. Before then, American audiences relied on touring groups of imported artists for professional quality ballet performances. George Balanchine with Suzanne Farrell in Don Quixote. When Kirstein met the noted Russian dancer-choreographer George Balanchine in London in 1933, he knew he had found the right person for collaboration on the dream of creating an official American ballet. Balanchine was classically trained at the Imperial School of Ballet in St. Petersburg since age ten. Also a student at the Petrograd Conservatory of Music, he studied piano and composition as well. At 20 years of age, Balanchine left the newly-formed Soviet Union for the West. Personally invited by ballet impresario Sergei Diaghilev, he was part of Monte Carlo-based Ballets Russes for nine years. Kirstein's invitation to come to America to start the school which would serve as the incubator of American ballet was a risky proposition, but Balanchine overcame any hesitation and took the leap of faith. The early years, however, were not without incident and frustrations. The school's first performance was postponed due to rain, and the initial tour of the newly-formed American Ballet met an untimely end with the simultaneous collapse of both its manager and treasurer. A three-year period under the Metropolitan Opera ended in disagreements. Several new companies were created and dissolved, and efforts ceased temporarily during World War II. Kirstein served in the Army while Balanchine returned to the Ballet Russes as choreographer. During this period, the School of American Ballet managed to survive, providing the indication that Kirstein's American ballet dream was still alive. In 1945, Leon Barzin, founder of the National Orchestra Association, launched a program called "Adventure in Ballet" with Kirstein and Balanchine. Not long after, he joined the company as its founding musical director. Jerome Robbins first came to the City Ballet in 1948, and joined again as a choreographer in 1969. Following the war, Kirstein and Balanchine formed the Ballet Society and presented their new company at New York's City Center for Music and Drama in 1948. That same year, Balanchine invited the 30-year-old Jerome Robbins to join the nascent company as assistant artistic director. 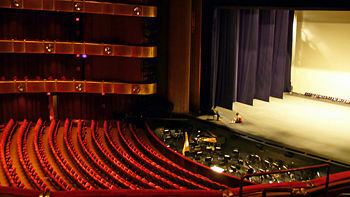 Morton Baum, then chairman of City Center's Finance Committee, was impressed by the quality of what he had seen at one of the performances and approached Kirstein with the suggestion that he transform the ensemble into a New York City Ballet. Kirstein, with his dream in sight, made Baum a promise: that in return for his faith, he would give New York City the finest ballet company in America within three years. On April 20, 1964, the Company moved into the New York State Theater, designed by Philip Johnson, to the specifications of Balanchine. After the move, the repertoire became dominated by the works of Balanchine, who remained its ballet master until his death in 1983. His works were complemented by those of choreographer Jerome Robbins, who resumed his connection with the company in 1969. Currently, the company is comprised of approximately 90 dancers, making it the largest dance organization in America. It has an active repertoire of over 150 works, principally choreographed by Balanchine, Robbins and Peter Martins. The School of American Ballet, now the official school of New York City Ballet, is thriving in its spacious home in The Samuel B. & David Rose Building at Lincoln Center with an enrollment of over 350 aspiring dancers from nearly every state in the nation and around the world. Following Balanchine's death in 1983, Robbins and Martins shared the title of ballet master-in-chief overseeing the operation of the New York City Ballet. Since 1990, Martins has had sole responsibility for the company's operations. In 2001, Christopher Wheeldon was named resident choreographer of the ballet. He is the first person to hold this title. 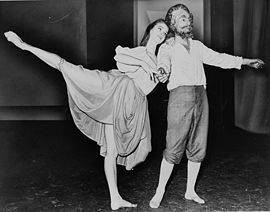 Among more than two score international engagements, the New York City Ballet has made numerous appearances in the capitals of Europe. The company has also appeared in Australia, Brazil, Japan, Sicily, South Korea and Taiwan and has made three historic trips to Russia, as well as visits to many of the major cities of the United States and Canada. ↑ Sofiane Sylve website www.sofsylve.com. Retrieved January 14, 2008. Gottlieb, Robert. George Balanchine: the Ballet Maker. HarperCollins, 2004. ISBN 0060750707. 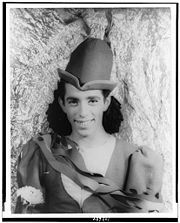 History of "New York City Ballet"
This page was last modified on 20 November 2018, at 16:18.